A wireless alarm and other passive circuit elements have been designed and it could detect any kind of smoke and generate alarm signal that would be sent to the control room by frequency modulation technique. It could operate around 100 Mhz. A monopole antenna has been used for transmitting the signal carrying the information in the free space. The designed wireless fire alarm has been very dynamic in terms of performance and the transmitter part successfully demonstrates the basic principle of FM transmitter. FM transmitter has been designed that would transmit signal at a particular frequency and could be received easily with a FM receiver. Most importantly design and build a cost effective wireless fire alarm that would work under any condition and be easily set up in commercial and residential areas. The construction include antenna, FM transmitter and FM receiver. The operation of a wireless fire alarm is very simple and generally follows the sequence shown on the figure. When there is a fire or smoke in the room the detector which is very sensitive quickly detects it and generates a signal or alarm which is transmitted by FM radio transmission and received at the control room. A frequency generator is used to generate a frequency radio signal with a particular band range, and for mixing the frequency radio signal with the transmission data, to make a transmission signal having a particular frequency; and a transmitter for amplifying the transmission signal having the particular frequency up to a predetermined level and for transmitting the same through an antenna. The receiver receives the transmission signal via a second antenna and filters the transmission signal to acquire desire data including the identification code and location data and compares the identification code with registered codes. The successful operation of the circuit depends on how well this portion functions. The alarm works by sensing the smoke produced during fire. The circuit produces an audible alarm when the fire breaks out with smoke.This sound will be transmitted by the FM transmitter. So before being transmitted, this audio signal should be amplified to optimum level. 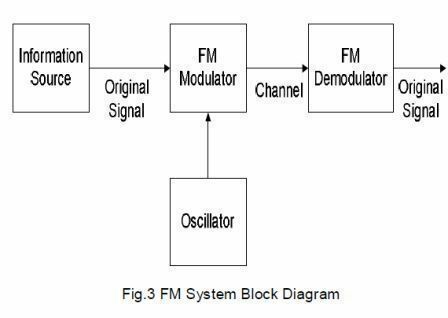 Frequency modulation is a type of modulation where the frequency of the carrier is varied in accordance with the modulating signal. The amplitude of the carrier remains constant. The information-bearing signal changes the instantaneous frequency of the carrier. Because the amplitude is constant, FM modulation process have low noise and provides high quality modulation technique. Frequency Modulation is also known as FM. Voice frequencies from the microphone are fed to special type of modulator called reactance modulator. The output of modulator causes the frequency of oscillator to change. The output of oscillator is amplified and the frequency is multiplied in the next section of transmitter. Antenna tuning is done by adjusting inductance L1 and capacitance C4 combined with the active antenna. The inductance and capacitance provides the reactance which combines with the inherent reactance of the active antenna to establish a resonance in a circuit including the active antenna. The established resonance is at a frequency other than the natural electrical resonant frequency of the active antenna. Adjustment of the inductance or capacitance changes this resonance. The signal is transmitted at this resonant frequency. The RF amplifier selects and amplifies the desired station from the many. It is adjustable so that the selection frequency can be altered. This is called tuning. In cheaper receivers the tuning is fixed and the tuning filter is wide enough to pass all signals in the FM band. The selected frequency is applied to the mixer. The output of an oscillator is also applied to the mixer. The mixer and oscillator form a frequency changer circuit. The output from the mixer is the intermediate frequency (IF). The IF is a fixed frequency of 10.7 MHz. No matter what the frequency of the selected radio station is, the IF is always 10.7 MHz. The IF signal is fed into the IF amplifier. The advantage of the IF amplifier is that its frequency and bandwidth are fixed, no matter what the frequency of the incoming signal is. This makes the design and operation of the amplifier much simpler. The amplified IF signal is fed to the demodulator. This circuit recovers the audio signal and discards the RF carrier. Some of the audio is fed back to the oscillator as an automatic frequency control voltage. This ensures that the oscillator frequency is stable in spite of temperature changes. The audio signal voltage is increased in amplitude by a voltage amplifier. The power level is increased sufficiently to drive the loudspeaker by the power amplifier. The range of the circuit was found to be more than 50 feet on the same floor.The signal could not be received clearly at different floor as harmonic effect was too strong.The received power reduces with the increment in distance as expected,The range at night and the sound quality of the signal was better.This was due to less amount of electrical equipment working at night reducing the overall interference. Wireless fire alarm by using Frequency Transmitter is used because its superiority over other analog modulation scheme such as amplitude modulation and pulse modulation. It also shows good sound quality, better reception and more immune to noise and signal distortion.FM is wide use because its is easy to modulate and the cheapest wireless communication technology.